SUBHEAD: And the place to start looking for solutions may be human history not some techno-future. 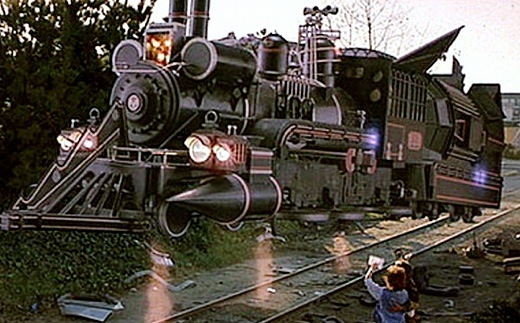 Image above: Scene of time travelling steam locomotive in "Back to the Future III". From (https://projects.handsupfortrad.scot/scotstradmusicawards/travelling-to-mg-alba-scots-trad-music-awards/). Last week I succumbed to a bad habit of mine that I’ve been trying to put behind me – leaving snarky comments on ecomodernist websites. I won’t dwell too much here on the ins and outs of the issues, or on ecomodernism itself – hell, there’s a whole page of this site devoted to that, even if it’s not very up-to-date. In this post, I’d just like to extract a few kernels from the issue that are relevant to my next cycle of posts. But first let me venture a working definition of the creed for anyone who’s lived thus far in blessed innocence of it: ecomodernism typically combines overenthusiasm for a handful of technologies as putative solutions to contemporary problems (typically nuclear power and GM crops), underenthusiasm for any social orders other than capitalist modernity, a fetishisation of both humanity and nature as surpassing splendours each in their separate spheres, questionable evidence-selection to support the preceding points, and high disdain for those who take a different view. The question I want to address in this post is why I get so easily riled whenever I encounter professions of this faith. Well, I guess I got off to a bad start: my first experience of it was a brush with the absurdly apoplectic Graham Strouts, and then the only marginally slicker Mike Shellenberger. I’d acknowledge that there are less strident voices within the movement who genuinely think it represents humanity’s best remaining shot at escaping the dangers encircling us. And since all the remaining shots available to us seem pretty long ones to me, if the ecomodernists could only concede the likely length of those odds I wouldn’t so much begrudge them their schemes. But – other than being the unfortunate possessor of a bilious personality, perhaps the likeliest explanation for my ire – I’d submit three general reasons as to why ecomodernism gets under my skin. The first is that I think it suffers from an intellectual phoniness. Not deliberately in most cases, I’m sure. But it reminds me of my time in academia. It reminds me of the kind of student, competent but coasting, who produces an overconfident seminar paper. It’s not that they haven’t done the reading and marshalled some evidence – though not quite as much as they think. It’s not that they haven’t put it together into some kind of logical framework that they genuinely think best fits the data – though not quite as neatly as they suppose. It’s that they haven’t fully inhabited the task. They’ve looked the world in the face, flinched, and written a Powerpoint presentation with a set of facts and bullet points instead. It reminds me, also, of the kind of academic colleague who’s charming and persuasive, who has a good story to tell, who hangs out with the right crowd, who churns out a large quantity of mediocre work which won’t endure but which serves their near-term purposes pretty well. It contrasts with the people who pursue the path of scholarship – meticulous, self-critical and questing after truths, rather than just a tale to tell. I think everyone who does intellectual work should aspire to work of the latter sort, and worry that their actual work doesn’t measure up, worry that it succumbs to the worldly temptations of the former, of being a merely ‘successful’ intellectual. I don’t think ecomodernism worries about this nearly enough to be convincing. And when it comes to telling stories, ecomodernism has a great one to tell. People really want to hear and believe in it – which means it’s rife with the potential for mischief-making. Essentially, it tells us that there’s nothing wrong with the way that we in the ‘developed’ countries now live – all that’s needed is for us to decouple economic growth from environmental degradation (which can be achieved relatively easily with some technological fixes) and for us to ensure that global resources are better shared among all the people of the world. And along the way it delivers a pleasingly counterintuitive message: some of the things environmentalists have traditionally told us were bad – like nuclear power, GM crops, pesticides, and the expropriation of peasantries – are actually pretty good, and some of the things they’ve traditionally told us were good – like organic farming and photovoltaic or wind energy – are generally pretty bad. It’s not hard to see why this story is so appealing to many people of goodwill living in the overdeveloped countries. All the more reason for its proponents to be sure of the line that they’re spinning and to welcome dissenting voices if they aspire to be scholars rather than spiritual preceptors. And yet this is so often not the case. I’d better restrict myself to just one small example from one of the articles that triggered my ire recently, Emma Marris’s Can we love nature and let it go?, which involves so much tendentious reasoning in among the odd telling point that I’ll be chasing my tail for page upon page if I fully engage with her arguments. The article makes the familiar pitch for decoupling human consumption from resource drawdown. Not much to object to there in principle. No facts I’d seek to dispute. The problem is the ecomodernist story Marris builds around it, because I see a wholly different one lurking in her text – I’ll briefly try to draw it out, with the caveat that I’m doing it in a back-of-the-envelope way to illustrate a point. I’m not offering polished scholarship. So, taking Marris’s relative decoupling point (she doesn’t distinguish between relative and absolute decoupling), it’s true that there’s been some improved efficiency in resource use. World Bank data, for example, show that between 1980 and 2000 (roughly the timeframe chosen by Marris to exemplify this point) global carbon dioxide emissions per unit of energy used declined by about 5%. They did then climb back up so that by 2015 they exactly matched those of 1980, which kind of makes me wonder if Marris’s timeframe was deliberately cherry-picked, but let’s leave that aside. The more significant point is that from 1980 to 2000 actual emissions increased by 27%, and actual gross world product increased by 300%. If we extend the timeframe from 1980 to 2013 (the last year figures are available from the World Bank dataset) then actual emissions increased by 84% and gross world product by 589%. I’ve played with these figures to construe various future scenarios, but I ran out of time and enthusiasm to put them into any kind of presentable numerical framework. However, I think I’m on firm ground in saying that if we want to achieve some modicum of global equity by 2050 while giving ourselves a shot at keeping climate change under 2ºC by following the kind of ecomodernist ‘decoupling’ and ‘no grand sacrifice’ scenario presented by Marris then we’ll probably have to find at least another world’s worth of economic activity in the next thirty years, adding another $80 trillion at a minimum to the existing gross world product of $80 trillion, and we’ll have to do that while decreasing carbon dioxide emissions year on year from now on at a little more than the rate we’ve been increasing them ever since 1980. In other words, Marris’s figures for relative decoupling between 1980 and 2002 don’t even begin to capture the magnitude of that task. Now, I acknowledge that her article is primarily about sparing land for nature rather than climate change as such (though it’s doubtful how much ‘nature’ will survive a rapidly warming world). And, sure, we can project the emergence of trend-breaking new technologies (nuclear power being an ecomodernist favourite, of course). But I’m not seeing evidence that takes these decoupling conjectures out of the realm of wishful thinking. Frankly, it amazes me that someone can invoke data suggesting a modicum of relative decoupling as any kind of harbinger of an adequately reduced cumulative human footprint in a world of ‘no grand sacrifices’ without conceding any plausibility to bleaker visions. This is the phoniness of which I speak. And there’s a lot of it about – philosopher Julian Baggini was at it only last week in this Guardian article. So let me state as clearly as I can the implications of the story I see written in the margins of the ecomodernist decoupling tale: it will be impossible to avert dangerous global climate change unless the current association between greenhouse gas emissions and economic growth is reversed immediately, an event whose likelihood is not suggested by any current evidence. If the solution to global poverty is sought through economic growth in the absence of fast absolute decoupling, then emissions will greatly increase, hastening the onset of dangerous climate change and threatening any anti-poverty gains. So it seems to me we face a situation in which both absolute greenhouse gas emissions and major global disparities in wealth need to be reduced rapidly, and the familiar tools for achieving this of technological innovation and economic growth simply aren’t up to the task. In these circumstances, I think we need at the very least to start considering some radically different ways of being – including the possibility of people in the richer countries living and farming more like people in the poorer countries. It’s no longer a question of trying “to squeeze more out of less” as Marris puts it – something that in any case we’ve signally failed to do (at best, we’ve squeezed even more out of more). I think it’s now a question of trying “to do different with different”. In fact, ‘doing different with different’ should always be a question – the ecomodernist notion that capitalist modernity is some kind of summit of human achievement (Anthony Warner: “By pretty much any measure you can think of, the golden age is now”) is an ethnocentric fancy. And this is the second reason why ecomodernism makes me angry – its complete ideological closure to doing different with different, which results from a crude and unexamined commitment to the ideology of the modern: for ‘progress’, against ‘romanticism’. Frankly, it annoys me that people trying to articulate agrarian populist approaches to intractable problems of poverty and environmental degradation have to waste so much time engaged in rearguard defences around these points – “No, I don’t think that peasants are all happy in their simple poverty, that we should ‘go back’ to living a simple, preindustrial life” and so on and so on. Worse, under the star of ecomodernism this debate quickly turns into an argument for biotechnology as intrinsically pro-poor – Bt cotton, glyphosate etc. as saviours of the poor. There’s a whole other side to that argument, but it’s a place I’m reluctant to go for fear of contributing to the unedifying spectacle of rich westerners arguing with other rich westerners about which of them is the true champion of the poor. We need to get over ourselves here, and debate how to overcome the scourge of poverty with openness. Moral high country blocks the view. The third reason for my anger is the David v Goliath nature of the battle. I don’t know anything about the funding of the ecomodernist firmament, but it’s a slick old business, with its thinktanks, TED talks, manifestos and briefings telling politicians, business leaders and the general public pretty much what they want to hear. Contrast that with the mere handful of academics, grassroots groups and lone wolf bloggers like me putting the case for agrarian populism and it feels like a losing battle. A couple of years ago my critique of the Ecomodernist Manifesto, got a modicum of wider notice and briefly drew me into a minor flurry of online debate, including a comment I left on Ben Heard’s website in response to his statement that the ecomodernists were open to challenging debate. I linked to a couple of my articles in which that debate was joined – to which Heard responded “At a smidge under 5,000 and 5,500 words respectively, I fear you may be writing to yourself rather than an audience. I only discovered this comment recently. At one level, the hypocrisy of it kind of amused me – my critique was pretty much the same length as the Manifesto, which Mr Heard happily read. Nobody is obliged to read anything, but I’m not sure you can conscionably call for a debate and then duck out of it by retrospectively imposing editorial conditions on your interlocutors. But ultimately, yes, I guess I am pretty much writing to myself, and though I feel honoured to have acquired a small online readership, no doubt my loquaciousness and lack of editorial professionalism limits my reach. I now just want to do the best thinking and writing I can within the limits of my capacities and circumstances. But then I get to thinking that ecomodernism is making the world just that little bit worse, making the solutions to its problems just that little bit more intractable, entrenching those habits of thought and deed which in the end will have to be disinterred and reconfigured that much more laboriously. And that makes me think that I ought to sharpen up my act, follow Mr Heard’s advice and try to make myself as slick as an ecomodernist. Perhaps I should form my own institute – the Breakdown Institute? Well, if anyone wants to give me a steer on this, I’m all ears. …which is just as well, because next up is my ‘History of the world in ten and a half blog posts’ – an essay considerably longer than the ones that so exasperated the ever-so-busy Mr Heard. Well, I’m pretty sure that ecomodernism lacks persuasive answers to our problems, so I think I need to look elsewhere, at my own pace. And the place to start looking is human history, in case it can turn up anything more promising. I’ll readily admit that past history is a poor guide to the future. Unfortunately it’s the only one we’ve got. Marris argues that the good thing about her decoupling approach is that it doesn’t rely on “a sudden and unprecedented improvement in our moral character”. An interesting point – did the proliferation of our contemporary environmental problems stem from a sudden and unprecedented degeneration in that character? I don’t think so. So maybe that suggests we might be able to learn some useful things for the future by looking at the past – which is not, of course, a very ecomodernist sort of thing to say. It ought to be.